VIOSO bietet als weltweit erster Hersteller reine Lösungen für die vollautomatische Beamer-Großbilderzeugung an und ermöglicht sogar Projektionen auf unebene und farbige Oberflächen. 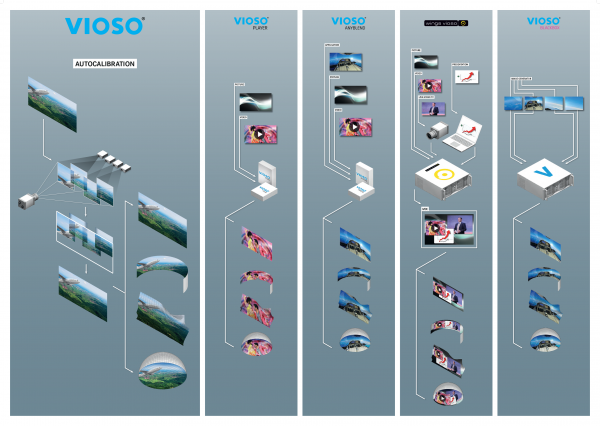 VIOSO is a vendor of soft- and hardwaresolutions for projector-based large scale displays. Since its founding in the year 2007, VIOSO has established itself as a reliable, successful partner to system integrators in the audiovisual industry. VIOSO’s patented smartprojecting technology was originally developed for the distortion-free, true-colour projection onto unusual surfaces like brick walls or rock faces. Creating such a virtual “blank screen” merely requires the automated, one-time calibration with the help of a digital camera connected to the control computer. The projector emits test patterns recorded by the camera. Once this procedure is complete, all projected contents are automatically adjusted on the underlying surface. Today this technology is mainly used for automatically creating scalable large format displays consisting of several individual projectors. VIOSO Player is the entry into VIOSO’s product portfolio. If offers easy to handle playback for pictures and high-res videos as well as all features of VIOSO’s unique smartprojecting technology. Wings VIOSO is the result of a joint venture with the famous media server and screen manufacturer AV Stumpfl. Since 2009 this product is one of the leading media servers for shows, events, museums, houses of worship and all kinds of individual installations. VIOSO also offers ready to run solutions, combining tailored hardware and highly optimized software. This bundles are there for simulation and gaming, as well as for fulldome projections and planetariums.